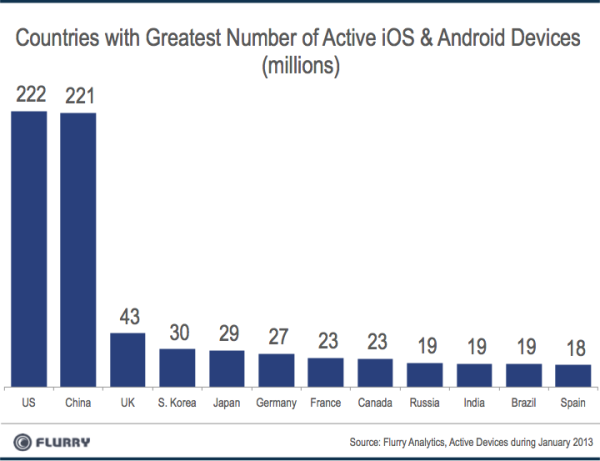 In November, mobile app services company Flurry announced that China was on track to top the U.S. and Android install base at some point in the first quarter of 2013. Today, Flurry says that has happened. China has passed the U.S. to become the world’s top country for active Android and iOS smartphones and tablets, a year after the country became the fastest-growing smart device market in the world. For its report, Flurry sourced from its entire data set of over 2.4 billion anonymous, aggregated app session daily across over 275,000 applications around the world. The company says it reliably measures activity in over 90 percent of the world’s smart devices. Flurry also revealed an updated look at the fastest-growing smart devices markets, year-over-year from January 2012 to last month. China’s 209 percent growth rate on top of a base of 71 devices last January is no longer the leader in terms of growth. Countries now growing faster than China this past year included Columbia, Vietnam, Turkey, Ukraine and Egypt. While Brazil, Russia, India and China may not be the fastest-growing, they have still added a significant number of new devices year-over-year: Brazil +11.5 million, Russia +12.0 million, India +12.4 million, China +149.5 million. China’s growing significance has the potential to really shake up the mobile industry. Apple notably broke out China as a standalone region on its balance sheet after years of lumping it in the “Asia-Pacific” group. China’s revenues were up 67 percent over the previous quarter, Apple said in January, having contributed $6.8 billion in revenue last quarter. That’s more than the $4.4 billion Japan did. 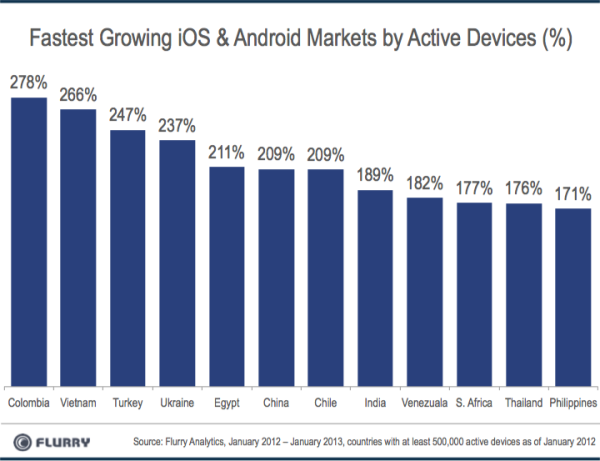 But Android is leading over iOS in China, in terms of sales. According to some reports, it has nearly three-quarters of the market by smartphone sales, 23 percent of which can be attributed to Samsung.